LILONGWE, Mar 3 2013 (IPS) - Over two million families who solely depend on Lake Malawi for their livelihoods are anxiously putting their hopes into an upcoming mediation between Malawi and Tanzania intended to put an end to a longstanding ownership dispute. The mediation will start this month after both parties agreed in December to engage the assistance of the Forum for Former African Heads of State and Government, which is chaired by Mozambique’s former President Joachim Chissano. “After several attempts to settle the dispute, we came to the realisation that we have failed and we needed a third party to help us,” principal secretary in Malawi’s Ministry of Foreign Affairs, Patrick Kambabe, told IPS. “In January, Malawi submitted its position after agreeing that the Forum help us to settle the dispute,” Kambabe said. In an interview with Tanzanian media, Kambabe’s Tanzanian counterpart John Haule confirmed that his country, too, had agreed to involving the former leaders and had submitted its own position paper to Chissano. “The forum is now reviewing the document and we will thereafter seek consultation if it is needed,” according to Haule. He said that he expected the matter to be settled in three months. According to authorities, about 1.5 million Malawians and 600,000 Tanzanians depend on Africa’s third-largest lake for food, transportation and other daily needs. When IPS visited Karonga District, on the shores of Lake Malawi, surrounding communities said they were worried about the increased tension and keen to see a resolution. “I used to cross the border into Kyela in Tanzania every two weeks to exchange sugar for clothes, which I sell. But now I only go once a month because Tanzanian immigration officials at Songwe border have become very harsh and are mistreating us,” said Joyce Nyirongo, a mother of four. She was fearful to elaborate on the mistreatment. Known as Lake Nyasa in Tanzania and Lago Niassa in Mozambique, the disputed water mass is thought to sit over rich oil and gas reserves, according to recent Malawian government reports. The mineral potential has rekindled a border dispute between Malawi and Tanzania, which has remained unresolved for almost half a century. The conflict escalated last July when Malawi awarded oil exploration licenses to United Kingdom-based Surestream Petroleum. And last December, Malawi awarded the second-largest license to SacOil Holdings Ltd. of South Africa, a move that deepened the crisis. Twice, the two countries tried to resolve the dispute diplomatically, but to no avail. Both countries are hoping for the best outcome that will settle the dispute, once and for all when mediation begins this month. Malawi’s first president, Hastings Kamuzu Banda, was the first to claim that Lake Malawi was part of the southern African nation. He based his claim on the 1890 Heligoland Agreement between Britain and Germany, which stipulated that the border between the countries lay along the Tanzanian side of the lake. The treaty was reaffirmed at the 1963 Organisation of African Unity Summit in Ethiopia and was reluctantly accepted by Tanzania. Malawi’s Foreign Affairs Minister Ephraim Chiume told IPS that their position is based on the 1890 Treaty and that the African Union in 2002 and 2007 upheld the colonial agreement. “The Heligoland Treaty gave the entire lake to us and this is what forms the basis of our position and proof that we own the entire lake,” said Chiume. Tanzania’s position is that the treaty was flawed. Tanzania has remained resolute that it owns half of the lake – saying that the border runs through the middle of the lake excluding the section that lies in Mozambique. Tanzania’s position is that a partition drawn in the middle of the lake, stressing that this is the practice among countries which share water bodies. “Tanzania has sought recourse to international law, which indicates that borders are generally in the middle of a body of water… Tanzania should therefore own half the lake,” Tanzanian Minister of Foreign Affairs Benard Membe told IPS in a telephone interview. 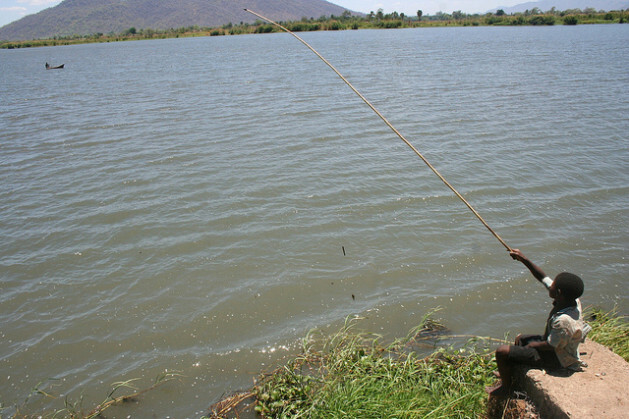 Membe said that the treaty was flawed because it denied Tanzanian’s living on the shores of the lake their given right to utilise proximate water and marine resources to earn their daily living. These are the positions that Chissano and his two colleagues; former South African President Thabo Mbeki and former Botswana President Ketumire Masire will have to consider. Meanwhile, the dispute has also brought to the fore the impact oil drilling would have on a fresh water lake blessed with over 2,000 different fish species, which attracts scuba divers the world over. Local environmentalists fear that drilling in the lake will damage eco-tourism and the marine environment affecting the fishing region in the northern part of the country. After direct talks between the two countries failed at the end of last year, Malawi President Joyce Banda had stated her intention to take the dispute to the International Court of Justice. Politicians and fisherfolk alike now hope that the mediation process will expedite a peaceful resolution to the conflict without the involvement of the court.